A bond is a debt security, similar to an I.O.U. When you purchase a bond, you lend money to the issuer of the bond. That issuer could be a corporation, state, city or federal government, a federal agency or other entity. In return, the issuer agrees to pay you a specified rate of interest over the life of the bond and to repay the face value of the bond (the principal) when it reaches maturity — that is, the date the bond comes due. There is a wide range of bonds available to investors, such as U.S. Treasury securities, municipal bonds, corporate bonds, mortgage- and asset-backed securities, federal agency securities and sovereign bonds. Market practices described here apply to the U.S. bond market, and may differ from those in other countries. You may also see bonds referred to as “bills,” “notes,” “debt securities,” or “debt obligations.” These terms all refer to a financial instrument that represents debt owed by an issuer. Whatever the purpose — saving for a new home, planning for your children’s college education, ensuring your retirement income or other financial goals — investing in bonds can help you achieve your objectives and play an important role in a diversified portfolio. Many financial professionals recommend that investors maintain a diversified investment portfolio of bonds, stocks and cash in varying percentages, depending on your circumstances and objectives. A financial professional can explain the available options, taking into account your investment goals, income needs and risk tolerance. Typically, bonds pay interest semiannually, providing a predictable stream of income. Many people invest in bonds for the interest income and to preserve their capital investment. Understanding the role bonds play in a diversified investment portfolio is especially important for retirement planning, as traditional defined-benefit retirement plans (pensions) have increasingly been replaced by defined contribution programs, such as 401(k) plans and Individual Retirement Accounts (IRAs). These plans offer greater individual freedom and a wider range of investment options, but require investors to be more self-reliant in planning their retirement. All investments carry some degree of risk — in general, the higher the risk, the higher the return. Conversely, lower levels of risk offer lower returns. That may mean you sacrifice the potential for higher returns in favor of a safer investment. There are a number of key variables that comprise the risk profile of a bond: its price, interest rate, yield, maturity, redemption features, default history, credit ratings and tax status. Together, these factors – as well as others discussed with your financial professional – determine the value of a particular bond and whether it might be an appropriate investment for you. The price of a bond is based on variables like interest rates, supply and demand, liquidity, credit quality, maturity and tax status. 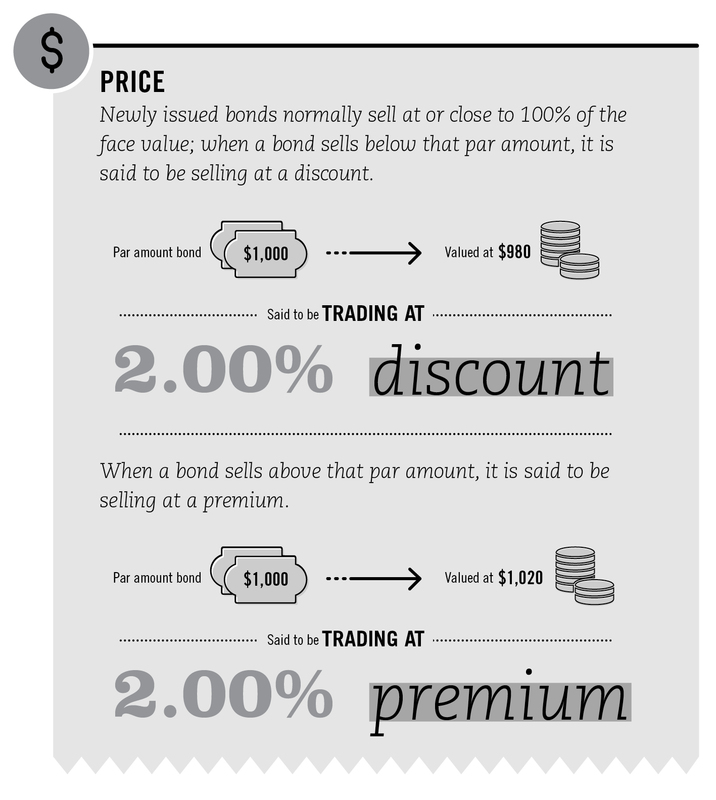 Newly issued bonds normally sell at or close to par (100% of the face value). Bonds traded in the secondary market, however, fluctuate in price in response to changing factors such as interest rates, credit quality, general economic conditions and supply and demand. When the price of a bond increases above its face value, it is said to be selling at a premium. When a bond sells below face value, it is said to be selling at a discount. 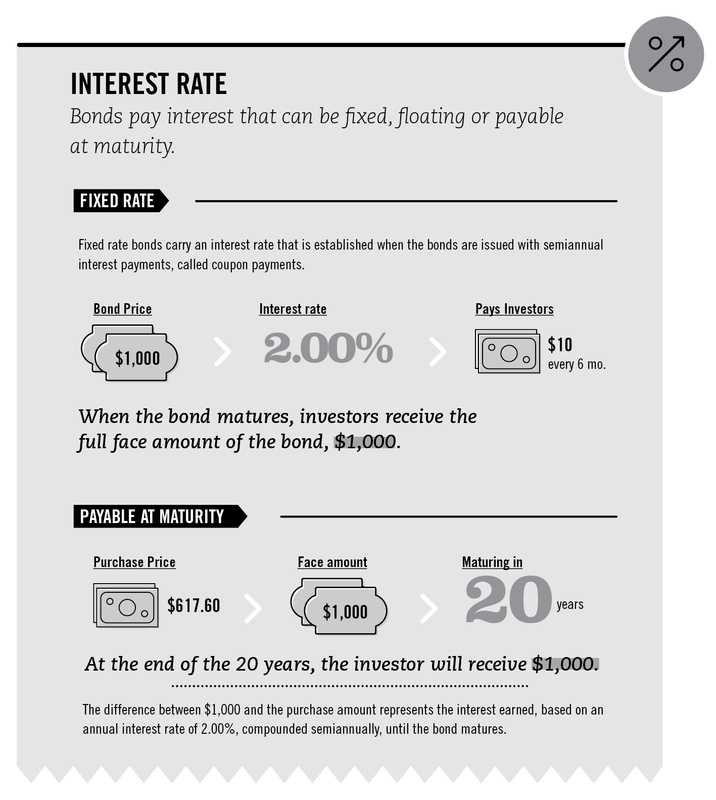 Bonds pay interest that can be fixed, floating or payable at maturity. Fixed rate bonds carry an interest rate that is established when the bonds are issued (expressed as a percentage of the face amount) with periodic interest payments, typically semiannual. Some issuers, however, prefer to issue floating rate bonds, the rate of which is reset periodically in line with the then prevailing interest rates on Treasury bills, the London Interbank Offered Rate (LIBOR), or other benchmark interest-rates. The third type of bond does not make periodic interest payments. Instead, the investor receives one payment at maturity of the face amount. Known as zero coupon bonds, they are sold at a substantial discount from their face amount. Valuation calculations may vary depending on the features of the bond. For zero-coupon bonds, since all accrued interest and principal are payable only at the bond’s maturity, the prices of this type of bond tend to fluctuate more than those of coupon bearing bonds. A bond’s maturity refers to the date on which the investor’s principal will be repaid. Generally, bond terms range from one year to 30 years. Short-term bonds are generally considered comparatively stable and safer because the principal will be repaid sooner and therefore usually offer lower returns. Conversely, longer-term bonds typically provide greater overall returns to compensate investors for greater pricing fluctuations and other market risks. Before buying a bond, always determine if there is a call provision. If there is, be sure to consider the yield to call as well as the yield to maturity. Since a call provision offers protection to the issuer, callable bonds usually offer a higher annual return than comparable non­ callable bonds to compensate the investor for the risk that the investor might have when reinvesting the proceeds of a called bond at a lower interest rate. A bond may have a put provision, which gives the investor the option to sell the bond to the issuer at a specified price and date prior to maturity. Typically, investors exercise a put provision when interest rates have risen so that they may then reinvest the proceeds at a higher interest rate. Since a put provision offers protection to the investor, bonds with such features usually offer a lower annual return than comparable bonds without a put to compensate the issuer. Some corporate bonds, known as convertible bonds, contain an option to convert the bond into common stock instead of receiving a cash payment. Convertible bonds contain provisions on how, when the option to convert can be exercised and at what price. Convertibles offer a lower coupon rate because they have the stable return of a bond while offering the potential upside of a stock. Certain bonds are priced and traded on the basis of their average life rather than their stated maturity. In purchasing mortgage-backed securities, for example, it is important to consider that homeowners often prepay mortgages when interest rates decline, which may result in an earlier than expected return of principal, reducing the average life of the investment (prepayment risk). If mortgage rates rise, the reverse may be true: homeowners will be slower to prepay and investors may find their principal committed longer than expected (extension risk). The yield is the return earned on a bond, based on the price and the interest payment received. Yield is usually quoted as a percentage. Sub-units of percentages are called basis points. One basis point is equal to one one-hundredth of a percentage point or 0.01%. There are three types of bond yields: current yield, yield to maturity, and in some cases, yield to call. Current yield is the annual return on the dollar amount paid for the bond and is derived by dividing the bond’s interest payment by its price. Yield to maturity is the total return received by holding the bond until it matures and is typically quoted as an annual rate. This figure is comman to all bonds and enables you to compare bonds with different interest rates, or coupons. Yield to maturity equals all the interest you receive from the time you purchase the bond until maturity. This includes all interest accrued at the time you purchased the bond, plus any gain (if bought at a discount) or less any loss (if you bought at a premium) of principal. 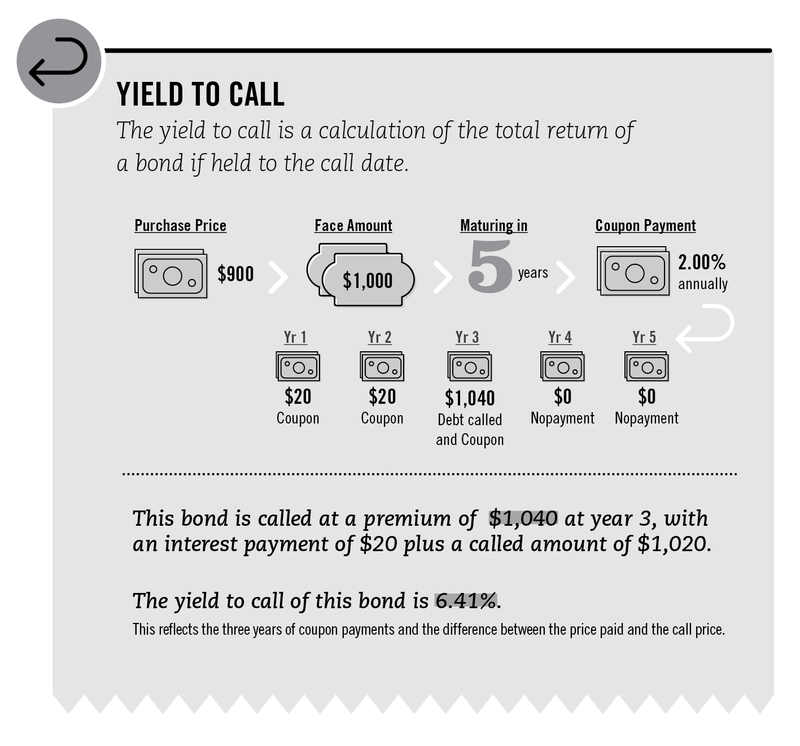 Yield to call is the total return received by holding the bond until it is called — or paid off before the maturity date — at the issuer’s discretion (refer to call provision). It is also typically quoted as an annual rate. Yield to call is calculated the same way as yield to maturity, but assumes that a bond will be called on the call date (rather than run until the maturity date) and that the investor will receive the face value of the bond plus any gain (if bought at a discount) or less any loss (if you bought at a premium) of principal. Be sure you know the yield to maturity and the yield to call, if applicable, on any bond you are considering to purchase. From the time a bond is originally issued until the day it matures, or is called, its price in the marketplace will fluctuate. General market conditions, including prevailing interest rates, the bond’s terms and credit rating and other factors affect that price. Because of these fluctuations, the value of a bond will likely be higher or lower than its original face value if you sell it before it matures. Generally, bond prices and interest rates tend to move in opposite directions. When interest rates rise, prices of outstanding fixed coupon bonds fall and vice versa. Prices of fixed coupon bonds move up and down inversely with interest rates to bring the yield of those bonds into line with the coupon rates of new bonds being issued. Interest rate changes do not affect all bonds in the same way. Generally, the longer a bond’s term, the more its price may be affected by interest rate fluctuations. Investors typically expect to be compensated for taking that extra risk. This relationship can be demonstrated by drawing a line between the yields available on similar bonds of different maturities, from shortest to longest. Such a line is called a yield curve. A yield curve can be drawn for any bond market, but the most common is for the U.S .Treasury market, which offers bonds of identical credit quality for various terms. By watching the yield curve over a period of time, as reported in the financial media and other sources online, you can gain a sense of where the market perceives interest rates to be heading — an important factor that could affect the price of bonds. A “normal” yield curve will show a fairly steep rise in yields between short- and intermediate-term issues and a less pronounced rise between intermediate- and long-term issues. This curve shape is considered normal because, usually, the longer an investment is at risk, the longer an investor is generally required to hold it. The yield curve is said to be steep if the yields on short-term bonds are relatively low when compared to long-term issues. This means you can obtain significantly increased yield — that is, interest income — by buying a bond with a longer maturity than you can with a shorter maturity bond. 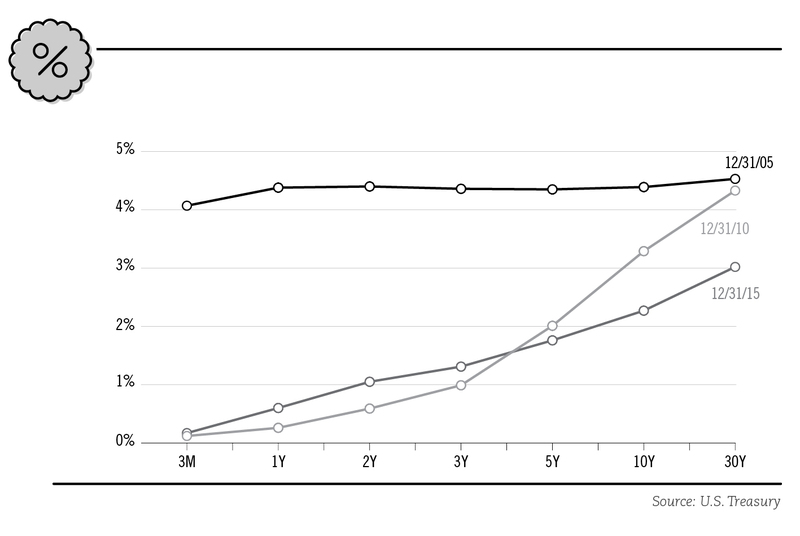 On the other hand, the yield curve is flat if the difference between short- and long-term rates is relatively small. This means that there is little reward for owning longer-dated maturities. When yields on short-term issues are higher than those on longer- term issues, the yield curve is said to be “inverted”. An inverted yield curve is rare and usually suggests that investors expect interest rates to decline in the future (with an outsized demand for longer dated issues) or short term rates are unusually high, for example, rates in a credit crunch. As a bond investor, you should know how bond yields and prices are linked to economic cycles and concerns about inflation and deflation. As a general rule, the bond market, much like the economy itself, benefits from steady, sustainable growth rates. Such moderate economic growth is beneficial for the financial health of governments, municipalities and corporate issuers which, in turn, strengthens the credit worthiness of those bonds you may hold. Steep rises in economic growth can lead to higher interest rates because, in response, the Federal Reserve may raise interest rates in order to slow down growth and prevent inflation. As described earlier, such an increase in interest rates will erode a fixed coupon bond’s price. Since rising interest rates push bond prices down, the bond market generally reacts negatively to reports of strong, and potentially inflationary, levels of economic growth indicated by higher-than-expected jobs growth or housing start numbers. The converse can also be true: negative economic news may indicate lower inflation and expected interest rate cuts and, therefore, may be positive for bond prices. When a bond issuer fails to pay principal or interest when due, it has “defaulted” on the debt. Defaults can also occur for failure to meet obligations unrelated to payment of principal or interest, such as reporting requirements, or when the issuer faces a material problem, such as bankruptcy. A bond is a type of debt obligation, so bondholders are creditors of the bond issuer. Therefore, bondholders will have priority rights to assets over equity holders when receiving a payout from the liquidation or restructuring of an issuer. The type of bond you hold will determine your status as a creditor. Secured bonds are backed by collateral. Types of collateral used to secure a bond can include cash, other types of securities, or physical assets such as real estate or equipment. If the bond issuer defaults, the secured debt holders have first claim to this collateral. Unsecured bonds are not backed by any specific collateral. In the event of a default, bond holders take their place as priority creditors of the issuer, as described above. Unsecured debt will generally offer a higher interest rate than those offered by secured debt due to a higher level of risk. Within the category of unsecured bonds, some may be senior bonds and have priority in making claims over those who hold subordinated bonds. A subordinated bond will typically offer a higher interest rate due to the higher level of risk. The array of credit quality choices available in the bond market ranges from the highest credit quality. Treasury bonds, which are backed by the full faith and credit of the United States government, to bonds that are below investment-grade and considered speculative, such as a bond issued by a start-up company or a company in danger of bankruptcy. Since a bond may not reach maturity for years to come, credit quality is an important consideration when evaluating investment in a bond. When a bond is issued, the issuer typically provides details as to its financial soundness and creditworthiness. This information can be found in a document known as an offering document, official statement or prospectus, which also explains the bond’s terms, features and risks that investors should know before investing. This article helps an investor evaluate the credit worthiness of the bond issuer and is typically found online on the issuer’s website, or in an online repository for bonds such as the municipal bond repository provided by The Municipal Securities Rulemaking Board (MSRB)’s Electronic Municipal Market Access (EMMA) website at http://emma. msrb.org, or through a financial professional. You should consult multiple sources before making a decision to invest in a bond. In the United States, major rating agencies include Moody’s Investors Service, Standard & Poor’s Corporation and Fitch Ratings. Each agency assigns its ratings based on the analysis of the issuer’s financial condition and management, economic and debt characteristics, and the specific revenue sources securing the bond. The highest ratings are AAA (S&P and Fitch Ratings) and Aaa (Moody’s). Bonds rated in the BBB/Baa category or higher are considered investment grade; bonds with lower ratings are considered high yield, or speculative. Lower ratings suggest a bond that may have a greater risk of default. It is important to understand that the high interest rate that generally accompanies a bond with a lower credit rating is being provided in exchange for the investor taking on the risk associated with a higher likelihood of default. The rating agencies make their ratings available to the public through their ratings information desks and their respective websites. Rating agencies continuously monitor issuers and may change their ratings of such issuer’s bonds based on changing credit factors. Usually, rating agencies will signal they are considering a rating change by placing the bond on CreditWatch (S&P), Under Review (Moody’s) or on Rating Watch (Fitch Ratings). Not all credit rating agency evaluations result in the same credit rating, so it is important to review multiple credit ratings and related updates to properly evaluate the underlying credit risks. Bear in mind that ratings are opinions, and you should understand the context and rationale for each opinion. Investors should not rely solely on credit ratings as a measure of credit risk but, instead, use a variety of resources to assist in evaluation and decision making. Additional sources of information can be found online and include recent independent news reports, research reports and issuers’ financial statements. Your financial professional can also serve as a valuable source of information and guidance. Bond insurance can be used to enhance a bond’s credit quality. Specialized insurance firms guarantee the timely payment of principal and interest, based on the claims paying ability of the insurer, in exchange for a fee. Insured bonds receive the same rating as the corporate rating of the insurer, which is based on the insurer’s capital and claims-paying resources. Taxation of cash flows derived from a bond varies based on many factors, such as the taxpayer’s citizenship and residency, and whether the taxpayer is a business or an individual. Taxpayers can also incur short or long term capital gains tax upon the sale or maturity of a bond previously acquired. Characteristics of the bond or issuer are important as well. The timing, amount, and characteristics of taxable income from bond investments varies based on a complex set of rules and taxpayer elections that is beyond the scope of this simplified overview. It is important to consider all the types of taxes and tax jurisdictions that can impact your net return on an investment in bonds, including, among other things, U.S. withholding tax, federal income tax, state and local tax, foreign tax, transaction taxes, estate or death taxes. Interest on municipal (muni) bonds often is tax favored for U.S. federal income tax purposes, but this is not always the case. Interest on muni bonds can be fully or partially tax exempt from U.S. federal income tax when paid to a U.S individual, and such interest can also be exempt from state or local tax, depending on the taxpayer’s residency and the location of the issuer. However, interest on certain muni bonds can increase the taxpayer’s liability under the federal alternative minimum tax, can limit the taxpayer’s entitlement to other means-tested federal tax benefits, and can affect the taxation of Social Security benefits. SIFMA does not provide tax advice, and the foregoing is not intended to be a substitute for a consultation with a tax professional who knows the characteristics of the bond and your tax circumstances. This section is intended to be a simplified overview of the basic tax characteristics of fixed income investments and it does not comprehensively address particular tax matters that may be relevant in your case. You should always consult with a tax professional when considering an investment in fixed income securities. There are several ways to invest in bonds, including purchasing individual bonds directly, or investing in bond funds or unit investment trusts. There is a wide variety of individual bonds to choose from in creating a portfolio that reflects your investment needs and expectations. Most individual bonds are bought and sold in the over-the-counter (OTC) market, although some corporate bonds are also listed on the New York Stock Exchange. The OTC market is comprised of securities firms and banks that trade bonds; brokers, or agents, who buy and sell bonds on behalf of customers in response to specific requests; and dealers, who keep an inventory of bonds to buy and sell. If you are interested in purchasing a new bond issue in the primary market (when it is first issued), your financial professional will provide you with the offering document, official statement or prospectus. You can also buy and sell bonds in the secondary market, after they have already been issued in the primary market. In the secondary market for outstanding bonds, prices are quoted in terms of par, or 100%. Thus, a bond quoted at “98” refers to a bond that is priced at $98 per $100 of face value, which equates to buying a bond with a face value of $5,000 for $4,900. There are a number of online tools to help investors compare current prices of bonds. Most of these tools allow you to sort and search bond data including yields, ratings and prices. Prices of U.S. corporate bonds are now more widely available, as mandated by rules issued by the Financial Industry Regulatory Authority (FINRA) and facilitated through its Trade Reporting and Compliance Engine (TRACE) at www.finra org/industry/trace. TRACE requires mandatory transaction reporting of OTC secondary market transactions in eligible fixed income securities. For municipal bonds, transaction price data and daily summary of trading activity can be obtained from the Municipal Securities Rulemaking Board’s (MSRB) Electronic Municipal Market Access (EMMA) portal at http://emma msrb org. For the U.S. government bond market, Treasury bond yields are available online, including on The Federal Reserve System website at www.federalreserve.gov/releases/H15/update. You can also compare prices for specific bonds through a financial professional. Bond funds let you diversify risks across a broad range of issues and opt for additional conveniences, such as having interest payments either reinvested or distributed periodically. Some funds are designed to follow a particular market or a specified index of bonds. These are often referred to as “index funds” or “passive funds.” Other funds are actively managed according to a stated objective, with bonds purchased and sold at the discretion of a fund manager. Unlike individual bond investments, a bond fund does not have a specified maturity date, because bonds are added to and eliminated from the portfolio in response to market conditions and investor demand, or to track an index. With open-end mutual funds, an investor is able to buy or sell a share in the fund at any time at the fund’s net asset value. Because the market value of bonds fluctuates, a fund’s net asset value will change to reflect the aggregate value of the bonds in the portfolio. As a result, the value of investment bond fund may be higher or lower than the original purchase price, depending upon how the underlying portfolio of bonds has performed. Closed-end mutual funds, on the other hand, are made up of a specific number of shares that are listed and traded on a stock exchange. The price of closed-end funds will fluctuate not only with the price of the underlying portfolio, but also the supply and demand of the shares of the fund, and so may be priced at, above, or below the net asset value of the fund’s holdings. Because the fund managers are less concerned about having to meet investor redemptions on any given day, their strategies can generally be more aggressive. Exchange-traded funds, or ETFs, are similar to closed-end funds, but have transparent portfolios and are generally passively managed to track an index. Independent investment research firms provide detailed analyses by subscription to which many libraries subscribe. Rating agencies also evaluate bond funds for credit quality. Most funds charge annual management fees while some also impose initial sales charges or fees for selling shares. Fees and sales charges will lower overall returns, so be aware of total costs when calculating expected returns on a bond fund investment. Many funds also require a minimum initial investment. Like individual bonds and other investments, bond fund investments entail risk. There are many factors that investors need to consider including the total costs, credit quality, manager quality, risks and the ability to exit these funds before making investment decisions. Bond unit investment trusts offer a fixed portfolio of investments in government, municipal, mortgage-backed or corporate bonds, which are professionally selected and generally remain constant throughout the life of the trust. The minimum initial investment is usually $1,000. As an investor, you earn interest income during the life of the trust and recover your principal, as bonds within the trust are redeemed. The trust typically terminates when the last investment matures. When building a bond portfolio, there are various techniques that can be used to match your investment goals and risk tolerance Investment strategy considerations, such as those noted in this section, do not guarantee protection from market risk. They are provided for general information only and are not intended to be a substitute for a consultation with a financial professional. One important consideration is how a portfolio is managed. Active investing involves ongoing buying and selling with continuous monitoring. The composition of the portfolio and how often it is traded depend on the investment decisions made by you or your financial professional. Passive investing involves limited ongoing buying and selling, also known as buy-and-hold strategy. The composition of a passively managed portfolio is typically diversified – and often mimics an index – with purchases made for the long term. Diversification refers to the investment strategy of including a variety of asset types in a portfolio to reduce risk – similar in concept to the expression, “don’t put all your eggs in one basket.” Regardless of your investment objectives, diversification is an important consideration in building any portfolio. Diversification may be achieved by buying a number of individual securities to construct your own diversified portfolio or by investing in a fund or funds, which themselves have diversified portfolios. Diversification by bond type may provide some protection for a portfolio: if one sector or asset class experiences a downturn, the performance of other parts of the portfolio may help offset the negative impact. For example, a bond portfolio might include a variety of high-yield and investment-grade, domestic and foreign, taxable and non-taxable, floating and fixed rate bonds. Another diversification strategy is to purchase bonds of various maturities in a technique called laddering. Holding bonds with a range of maturities can reduce your portfolio’s sensitivity to interest rate changes. Assuming a normal yield curve, laddering allows higher returns than if you bought only short-term bonds, but with less risk than if you bought only long-term bonds. If, for example, you invested only in short-term bonds, which are less sensitive to rate changes, you would have more stability but lower returns. On the other hand, holding only long-term bonds may bring greater returns, but more volatile prices. Barbells are an investment strategy similar to laddering, except that purchases are concentrated in the short-term and long-term maturities. This allows you to capture high yields from longer maturities in one portion of their portfolio, while using the lower maturities to minimize risk. Always talk with your investment advisor to discuss which investments are most appropriate for you. If you choose to pursue an investment in bonds, be sure to receive more detailed information about each of the specific types of bonds in which you are interested before investing. Accrued interest. Interest deemed to be earned on a security, but not yet paid to the investor. Ask price (or Offer price). The price at which a seller is willing to sell a security. Average life. On a mortgage security, the average length of time that each principal dollar is expected to be outstanding, based on certain assumptions about prepayment speeds. Basis point. One one-hundredth (.01) of a percentage point Yield differences are often quoted in basis points (bps). Bid price. The price at which a buyer is willing to purchase a security. Bond fund. A professionally managed investment vehicle, which invests primarily in bonds. Types of bond funds include open-ended mutual funds, closed-end mutual funds, and exchange traded funds. Bond insurers and reinsurers. Specialized insurance firms serving the fixed-income market that guarantee the timely payment of principal and interest on bonds they insure in exchange for a fee. Book-entry. A method of recording and transferring ownership of securities electronically, eliminating the need for physical certificates. Bullet bond / Bullet maturity. A bond that pays regular interest, but that does not repay principal until maturity. Callable bonds. Bonds that are redeemable by the issuer prior to the maturity date, at a specified price at or above par. Call premium. The dollar amount paid to the investor by the issuer for exercising a call provision that is usually stated as a percentage of the principal amount called. Cap. 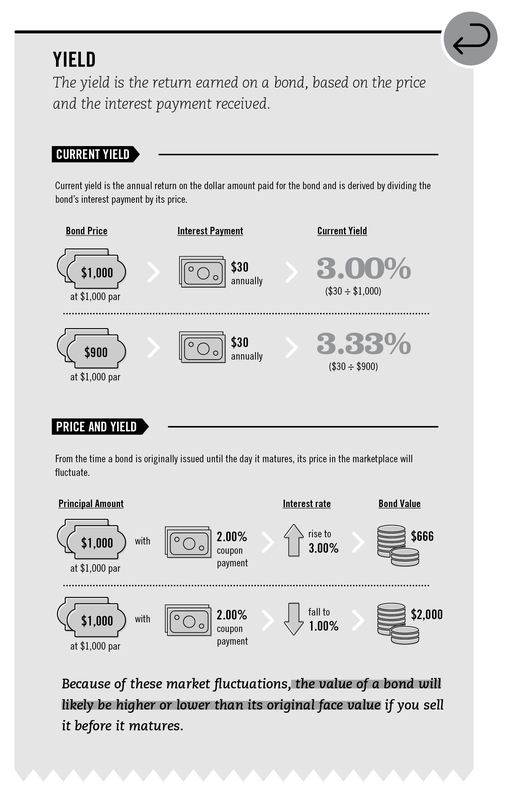 The maximum interest rate that may be paid on a floating-rate security. Closed-end mutual fund. A mutual fund created with a fixed number of shares via a public offering, which is traded as listed securities on a stock exchange. See mutual fund. Collar. Upper and lower limits (cap and floor, respectively) on the interest rate of a floating-rate security. Compound interest. Interest that is calculated on the initial principal and previously paid interest. Also known as “interest on interest”. Convertible bond. A bond that can be exchanged, at the option of the holder, for a specific number of shares of the issuing company’s stock. Because a convertible bond is a bond with a stock option built into it, it will usually offer a lower than prevailing interest rate. Coupon. The feature of a bond that denotes the interest rate (coupon rate) it will pay and the date on which the interest payment will be made. Coupon payment. The actual dollar amount of interest paid to an investor. The amount is calculated by multiplying the interest rate of the bond by its face value. Coupon rate. The interest rate on a bond, expressed as a percentage of the bond’s face value. Typically, it is expressed on a semi-annual basis. Credit rating agency. A company that analyzes the credit worthiness of a company or security, and indicates that credit quality by means of a grade, or credit rating. Current yield. The ratio of the interest rate payable on a bond to the actual market price of the bond, stated as a percentage. Dated date (or Issue date). The date of a bond issue from which a bond begins to accrue interest. Default. A failure by an issuer to: (i) pay principal or interest when due, (ii) meet non-payment obligations, such as reporting requirements or (iii) comply with certain covenants in the document authorizing the issuance of a bond (an indenture). Discount. The amount by which the par (or face) value of a security exceeds its purchase price. Discount note. Short-term obligations issued at a discount from face value, with maturities ranging from one to 360 days. Discount notes have no periodic interest payments; the investor receives the note’s face value at maturity. Embedded option. A provision that gives the issuer or bondholder an option, but not the obligation, to take an action unilaterally. The most common embedded option is a call option, giving the issuer the right to call, or redeem, the principal of a bond before the scheduled maturity date. Exchange-traded fund (ETF). An ETF is a type of fund that is an exchange traded security, experiencing price changes throughout the day as they are bought and sold ETFs own underlying assets that typically track an index. Extension risk. The risk that investors’ principal will be committed for a longer period of time than expected In the context of mortgage- or asset-backed securities, this may be due to rising interest rates or other factors that slow the rate at which loans are repaid. Face (or Par or Principal). The principal amount of a security that appears on the face of the bond. Fixed rate bond. A bond with a set interest rate to maturity. Floating rate bond (or Variable rate bond or Adjustable rate bond). A bond with an interest rate that is adjusted periodically according to a predetermined formula; it is usually linked to a benchmark interest rate such as LIBOR. Floor. The lower limit for the interest rate on a floating-rate bond. Future value. The value of an asset at a specified date in the future, calculated using a specified rate of return. High grade bond. See Investment-grade bond. High-yield bond (or junk bond). Bonds rated Ba (by Moody’s) or BB (by S&P and Fitch) or below, whose lower credit ratings indicate a higher risk of default. Due to the increase risk of default, these bonds typically offer a higher yield than more creditworthy bonds. Interest. Compensation paid or to be paid for the use of assets. Investment-grade bond (or high grade bond). Bonds rated Baa (by Moody’s) or BBB (by S&P and Fitch) or above, whose higher credit ratings indicate a lower risk of default. These bonds tend to offer a lower yield than less creditworthy bonds. Issue date. See Dated date. Issuer. The entity obligated to pay principal and interest on a bond. Junk bond. See High-yield bond. LIBOR (London Interbank Offered Rate). A benchmark interest rate some banks charge each other for short-term loans. LIBOR is set daily in f1ve currencies (US dollar, Euro, pound sterling, Japanese yen and Swiss franc) for seven different maturities (overnight , on week, and 1, 2, 3, 6 and 12 months). LIBOR is frequently used as the basis for resetting rates on floating-rate securities, as well as currency and interest rate swaps. Liquidity (or marketability). A measure of the relative ease and speed with which a security can be purchased or sold in a secondary market. Maturity. The date when the principal amount of a security is due to be repaid. Mortgage pass-through security. A type of mortgage-backed security representing a direct interest in a pool of mortgage loans. The pass-through issuer or servicer collects payments on the loans in the pool and “passes through” the principal and interest to the security holders on a pro rata basis. Mutual fund. An investment vehicle that invests pooled cash of many investors to meet the fund’s stated investment objective. Non-callable bond. A bond that cannot be called for redemption by the issuer before its specified maturity date. Offering document (Official Statement or Prospectus). The disclosure document prepared by the issuer that gives detailed security and financial information about the issuer and the securities being issued. Official statement. See Offering document. Open-end mutual fund. Open-end mutual funds stand ready to sell and redeem their shares at any time at the fund’s current net asset value: total fund assets, less any liabilities, divided by the number of shares outstanding. See mutual fund. Paying agent. The entity, usually a designated bank or the office of the treasurer of the issuer, that pays the principal and interest of a bond. Premium. The amount by which the price of a bond exceeds its par value. Prepayment. The unscheduled partial or complete repayment of the principal amount outstanding on a loan, such as a mortgage, before it is due. Prepayment risk. The risk that principal repayment will occur earlier than scheduled, forcing the investor to receive principal sooner than anticipated and reinvest at lower prevailing rates. The measurement of prepayment risk is a key consideration for investors in mortgage- and asset-backed securities. Present value. The current value of a future payment or stream of payments, given a specified interest rate; also referred to as a discount rate. Primary market. The market for new issuances. Ratings. 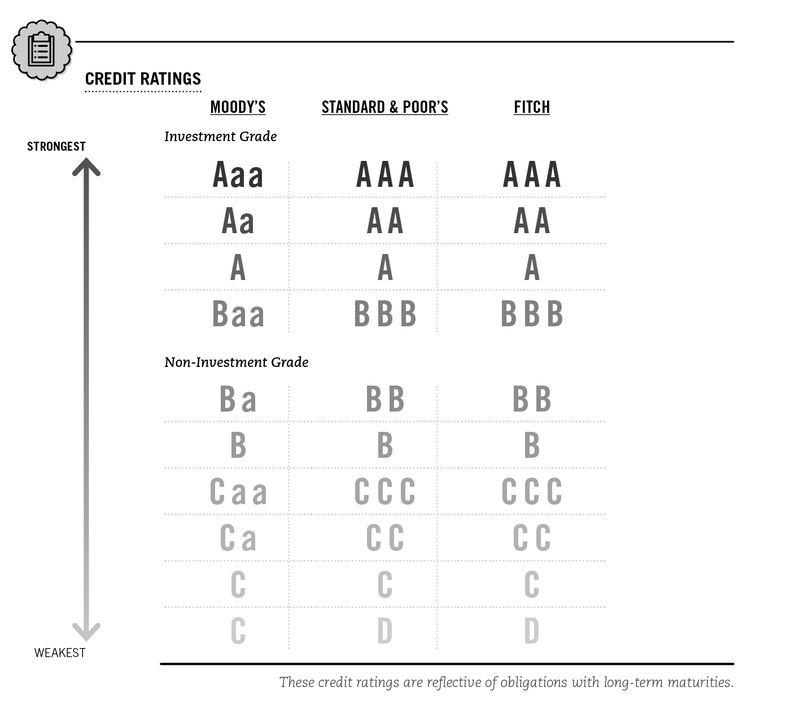 Designations used by credit rating agencies to give relative indications as to opinions of credit quality. Reinvestment risk. The risk that interest income or principal repayments will have to be reinvested at lower rates in a declining interest rate environment. Risk. The chance that an actual return will be different than expected, including losing some or all of the invested amount. There are many types of risk such as market risk, credit risk, interest rate risk, exchange rate risk, liquidity risk, and political risk. Secondary market. Market for previously issued securities. Secured bond. A bond repayment that is backed by collateral. Senior bond. A bond that has a higher priority than other bond’s claim to the same class of assets. Settlement date. The date for the delivery of bonds and payment of funds agreed to in a transaction. Subordinated bond. A bond that has a lower priority than another bond’s claim to the same assets. Trade date. The date upon which a bond is purchased or sold. Transfer agent. Also known as the bond registrar and is the party appointed by an issuer to maintain records of bondholders, and transfers ownership when bonds are acquired or sold. Trustee. An institution, usually a bank, designated by the issuer as the custodian of funds and official representative of bondholders. Trustees are appointed to ensure compliance with the trust indenture and represent bondholders to enforce their contract with the issuers. Unit investment trust. An investment fund created with a fixed portfolio of investments. Unsecured bond. A bond repayment that is not secured by collateral. Yield curve. A line tracing yields on a type of bond over a spectrum of maturities. Yield to call. The yield to call is a calculation of the total return of a bond if held to the call date. It takes into account the value of all the interest payments that will be paid until the call date, plus interest on earned on those payments (using the current yield), the principal amount to be received on the call date and any gain or loss from the purchase price expressed as an annual rate. Yield to maturity. 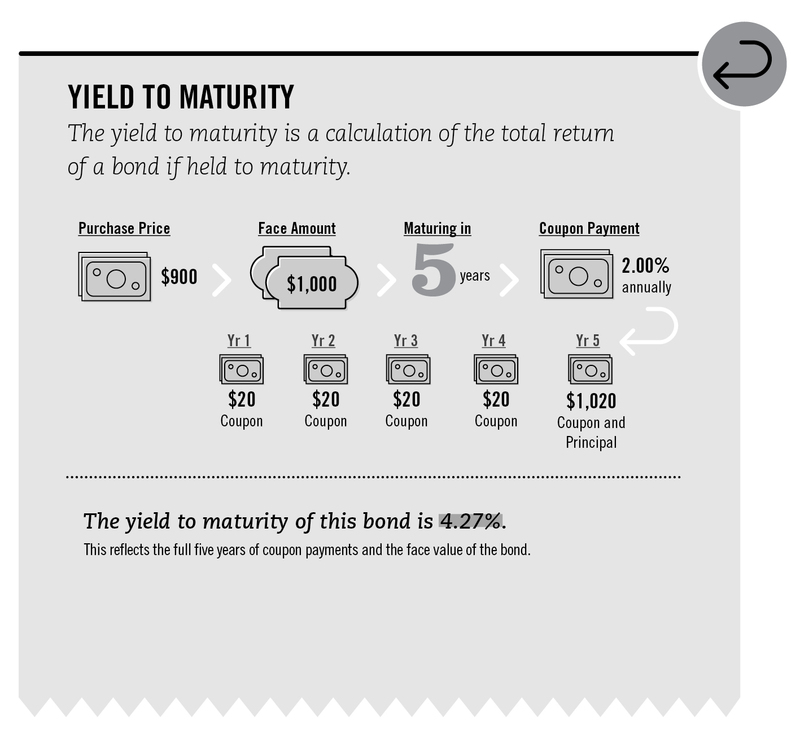 The yield to maturity is a calculation of the total return of a bond if held to maturity. It takes into account the value of all the interest payments that will be paid until the maturity date, plus interest on earned on those payments (using the current yield), the principal amount to be received and any gain or loss from the purchase price expressed as an annual rate. Zero-coupon bond. A bond that does not make periodic interest payments; instead, the investor receives one payment, which includes principal and interest, at redemption (call or maturity) See Discount note.